Virtually everyone knows the name Francis Scott Key. And virtually everyone knows it for one reason: for the fact that he was the author of the words that became our National Anthem. But there was much more to Frank Key—as he was known to family and friends—than the words he wrote in Baltimore Harbor on the night of September 13-14, 1814, when he was 35 years old. 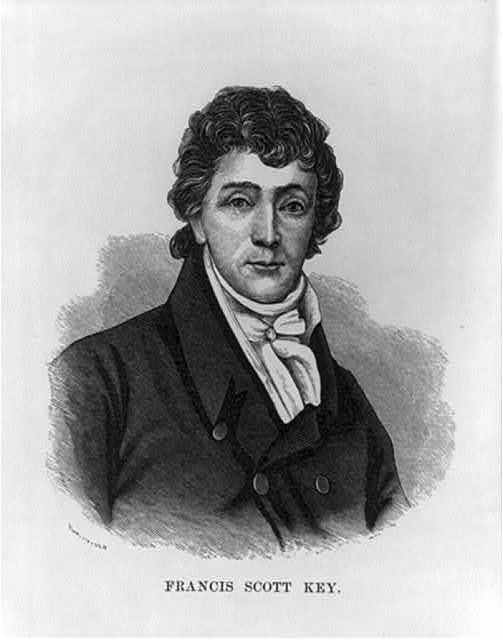 Key was born into a prominent Maryland family in 1779, graduated from St. John’s College in Annapolis in 1796, and went on to have a big legal career in Washington, D.C. He ran a thriving private law practice, argued more than a hundred cases before the U.S. Supreme Court, and served as U.S. Attorney in Washington for eight years. A closer adviser to President Andrew Jackson, Key was an influential voice in shaping the major issues facing the Early Republic—including the No. 1 issue, the question of slavery. A devoutly religious man, Key was adamantly against international slave trafficking. And he was well known for defending free blacks and slaves without charge in the Washington, D.C., courts. He also was a life-long slave owner from a large slave-owning family, and was a founding member in 1816, and strong proponent for the rest of his life, of the American Colonization Society. That controversial group’s goal was to set up a colony in West Africa for free American blacks (not slaves). Key and the other ACS supporters—a group that included James Monroe, James Madison, John Marshall, Henry Clay, Daniel Webster, and many others–was reviled by abolitionists and by many free blacks as little more than a vehicle to rid the nation of African Americans. Frank married Mary Tayloe Lloyd in 1802. Know as Polly, she came from an extremely prosperous Maryland family. Her father, Col. John Lloyd, owned the extensive Wye Plantation, along with hundreds of slaves, including the famed abolitionist Frederick Douglas, who was born there in 1818. Frank and Polly had eleven children. Tragically, three of their sons died while their parents were alive. Eight-year-old Edward Key drowned in the Potomac River near the Keys’ backyard in 1822; twenty-two-year old Daniel Murray Key was killed in a duel in 1836; and thirty-year-old John Ross Key died after a short illness in 1837. Roger B. Taney, the U.S. Chief Justice best known for issuing the infamous majority opinion in the 1857 Supreme Court Dred Scott case, was Francis Scott Key’s brother-in-law, having married his only sister Anne. The two lawyers were very close personal and professional friends and colleagues from, the time they met as young law students in Annapolis in the late 1790s to Key’s death of 1843. Click here to support Star Spangled Music Foundation by purchasing Marc’s book!